Brush fillets well with a little oil. Pre heat Pan or BBQ plate 3-4 minutes on a medium heat. Cook the pork fillets 4-5 minutes on each side (3 sides) turning frequently. Combine the glaze ingredients together in a small jug. When pork fillets are almost cooked pour over the glaze and coat the fillets well, turning for 1-2 minutes to caramelise the glaze. Remove the pan from the heat and allow fillets to rest 3 -4 minutes in the glaze. Toss the slaw ingredients in a large bowl with the dressing. Place a bed of slaw in the center of each serving plate. 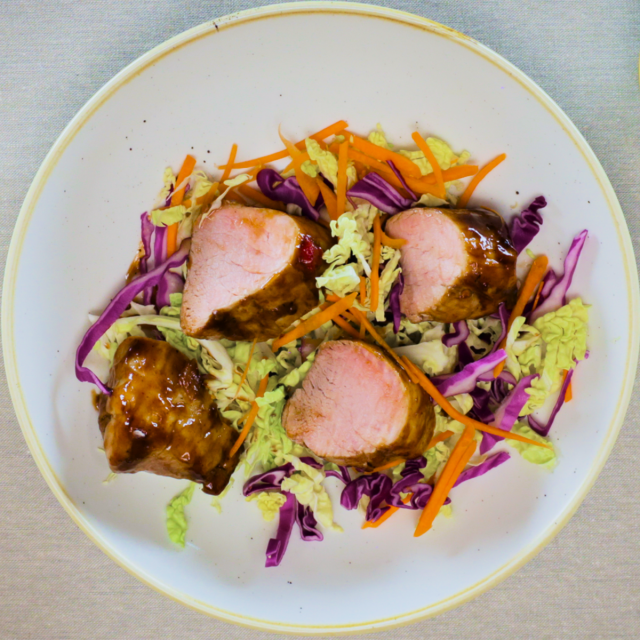 Slice the pork fillets into diagonal thick slices and arrange over the slaw. Drizzle with a little extra glaze and serve. Notes: This dish maybe be served warm or cold with a little extra glaze on the side.